Started reading an interesting paper by Jesper Holm Olsen and Søren Skov on cache-oblivious algorithms. When I first heard "cache" I was thinking memcache, ehcache, etc., but they're referrig to CPU caches (L1, L2, etc.). Most of us are aware of developing and analyzing algorithms with the RAM (random access machine) model, in which we have infinite memory and access is constant. For example, you have n inputs that fit neatly into memory, it's going to take you n log n with some constant factors thrown in for a comparison based sort. While this model is simple and sufficient for many problems, for others we need better models and an understanding of the underlying hardware. For example, we see this in database systems that makes use of B-trees whose node size is typically related to the disk block size because disk access is relatively slow. Such algorithms, using an I/O model, are cache-aware. Analysis of cache-aware algoirthms depend on block and internal memory sizes. For example, a scan would take something like n/B + 1, where B is the block size. Even if you take the disk out of the picture, today's processors have hierarchical memory. L1 cache memory is a lot faster than L2, than L3, than main memory. To develop optimal algorithms you may need to be aware of these caches and their structures. Obviously this makes it difficult to move a cache-aware algorithm's implementation from one architecture to another, since each architecture will have different memory sizes and structure; and different memory hierarchy levels. Enter cache-oblivious algorithms. As the name implies, these algorithms don't care about the underlying memory structure and size. The model is still based on some block size B and internal memory M, but these values don't need to be tweaked to get optimal performance. An algorithm is cache oblivious if no program variables dependent on hardware conﬁguration parameters, such as cache size and cache-line length need to be tuned to minimize the number of cache misses. The authors go on to discuss some cache-oblivious algorithms in detail. Haven't read the rest of the paper, but thought I'd pass it along in case you're looking for something fun to read. file under: interesting stuff I'll probably never use. On a beautiful, warm Sunday in San Francisco there's nothing more enjoyable than doing laundry and reading up on hashing. I'm being sarcastic if it wasn't obvious (maybe there are people out there who enjoy doing laundry). Fundamentally, hashing is a simple, basic concept. But there's all kinds of neat things you can do with hashing. There's consistent hashing if you want to build a distributed hash table or route your requests to a dynamic server farm. I wrote about it a while back, but unfortunately things got deleted during the migration. You can try this link for a Google cached version. Hashing plays a big part in cryptography so you can securely buy laundry detergent online at Amazon.com. Compiler writers like to use perfect hashing for keyword look ups and switch statement optimization. When talking about hashing and hash functions/values/codes collision should be part of the discussion. Yet you'd be surprised how many developers aren't aware or simply ignore collisions when using a hash based data structure. Often the reasoning is that the probability of hash(key1) = hash(key2) for random keys is so low it is acceptable to pretend that it will never happen. With a 32-bit hash output, for example, there's something like 4+ billion possible values. One in 4 billion is pretty good odds. But you need to be careful about how you calculate collision probability. You might have heard of the birthday problem/paradox or the birthday attack. The probability that two people have the same birthday is not that high, 1/365 ignoring leap years. The probability that in a small group someone will have the same birthday as you is still pretty low. But if you are hosting a cocktail party for just 23 friends there's more than a 50 percent chance that two people will have the same birthday. For a 32-bit hash output this means that if you have about 10,000 objects there's a one percent chance that there's a collision for at least one pair. That's a lot more than one in 4 billion. Say you want to build a fault-tolerant distributed system (who doesn't). Easy enough, you just replicate a bunch of state machines, the so-called state machine approach. Here's a little more detail to get you started. At the core is the consensus problem. In order to keep the replicas consistent we need an algorithm for choosing a single value when multiple values may be proposed. The Paxos algorithms can help us. The specific Paxos algorithm discussed below is the "basic" one (there's a bunch of Paxos algorithms). The model is asynchronous and non-Byzantine. This means that a process may crash and recover, but doesn't do anything weird like sending random, deceitful messages to other processes. There are three players in the algorithm: proposers, acceptors and learners. 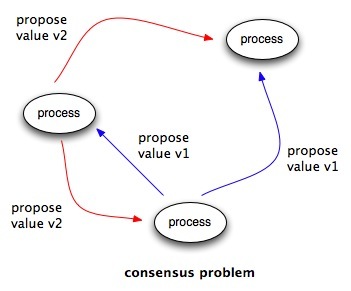 Proposers propose values, acceptors accept (or reject) proposals, and learners become aware of the accepted proposal values. These are logical distinctions, a single process could be all three. A proposer first sends out a prepare message, basically asking the acceptors if they promise to accept the proposer's proposal. 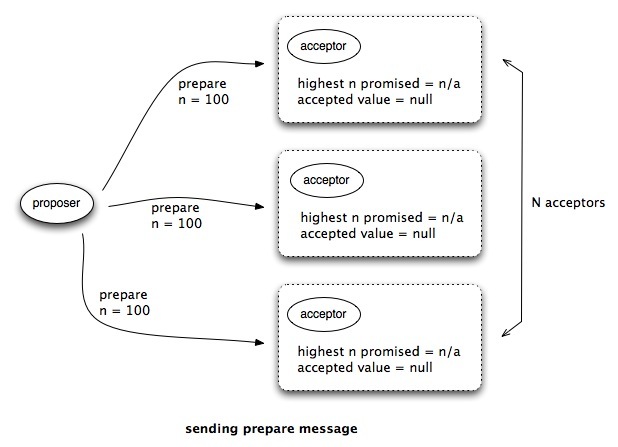 The prepare message is pretty simple, it just has a unique proposal number n. Initially, when the acceptors receive the prepare message they will reply with a prepare OK and remember the proposal number they promised to accept. In this example the acceptor promises to accept proposal for n = 100 and will ignore requests for n < 100. But the prepare OK message may also contain an already accepted proposal value (say when a different proposer tries to send a prepare message). Here, a proposer with n = 105 sends a prepare message to an acceptor that has already accepted a value for n = 100. The proposer will need to use that value in subsequent requests to maintain consistency. In the "normal" case the value sent back is null and the proposer is unconstrained, so it can propose any value it wants (the value requested by the client). Once the proposer receives a majority of N response (prepare OK messages) it can issue accept requests. As long as the acceptor has not promised to accept requests for a higher n then it will accept the proposal and send an accepted acknowledgment. When a majority of N accepted messages are received by the learner the learner becomes aware of the accepted proposal value. Notice that at key points in the algorithm data is saved to stable storage so that upon crash recovery things remain consistent. The reason for requiring a majority N in the algorithm is intuitive. If a majority has accepted the proposal then losing any minority is still acceptable. Returning to the proposal number. 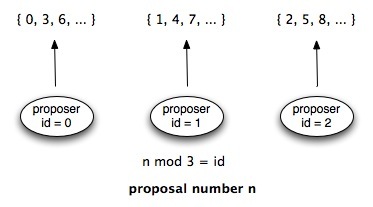 Each proposer needs to use proposal numbers that are unique. In this example we have three proposers and three disjoint sets. Each proposer uses numbers from one of the sets. The proposal numbers in the sets are calculated by a simple mod operation. Pretty simple, huh? Of course there are many challenges when you actually want to implement this algorithm, but let us leave that as an exercise to the reader. And that's my interesting algorithm of the week (corrections appreciated). Incidentally, I love this OmniGraffle Professional drawing program. For the first time I'm thinking, wow, this program blows anything I've used on Windows (i.e., Visio).